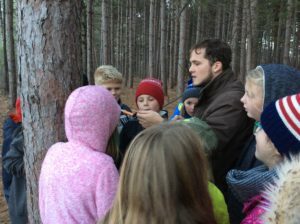 Last week the Windham-Ashland-Jewett (WAJ) science club got to think about the forest ecosystem in a whole new way! Andrew Randazzo (CCE Environmental Educator) and Deb Valerio (teacher from WAJ) helped familiarize club participants with dendrochronology. Dendrochronology is the study of tree age using tree rings. It is used to both understand tree growth patterns as well as atmospheric and climatic conditions. Developing an understanding of dendrochronology helps students paint a big picture. A picture that displays the interconnected nature of the forest ecosystem. Through the use of a Lab-aids dendrochronology kit as well as an increment borer students made connections between tree growth, weather patterns and the availability of water. All with a focus on field based instruction and learning. The WAJ Science club would not be possible without the generous financial support of The Windham Foundation.